Hopefully it’ll give you the confidence that you should go ahead and do it! I suspect that it’s the moving abroad that puts most people off living abroad. First there’s the actual moving abroad. How many possessions will you take with you? Which possessions will you need in your new country? How will you get those possessions to your new home? How will you get to your new home? The good news is that if you’re methodical about it moving abroad is doable. In this moving abroad checklist we’ve listed all the things you need to think about when moving abroad. Flying with children can be another thing that puts people off moving abroad, and even travelling. The good news is that there are lots of things you can do to make it easier. It also gets much easier the more you do it. 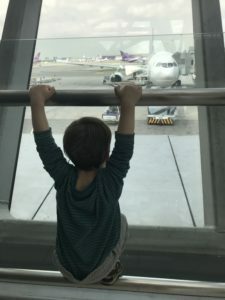 We’ve been to 15 countries and done nearly 60 flights in the last 3 years, all with children. I’d also recommend you read this article. People worry about flying with a baby, but they really shouldn’t. It’s much much easier than people think. Personally I feel that sleep is one of the main things that makes travelling with children hard. 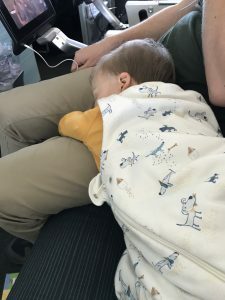 If you’re planning to fly with children, I recommend you read this article. One of the key benefits to living abroad is that it forces you to be minimalist. You have to choose which possessions to take with you. Anything you don’t take has to be either thrown out, sold or kept somewhere. Once you start travelling a lot you’ll find that doing anything with your possessions becomes tiresome. Especially once you also have children to manage. When we moved to Germany we took a moving truck with 30 boxes plus stand alone furniture like our son’s cot. 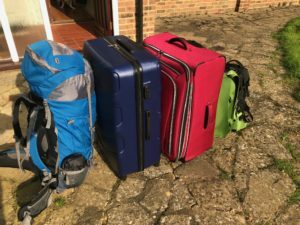 When we moved to Chiang Mai two years later we took 2 suitcases, 2 rucksacks and a carry on bag. We vowed not to repeat the palaver of Germany, so were forced into a minimalist move. We only kept the bare minimum (no more moving truck with 30 boxes!). If we didn’t need it for 6 months (or longer) then we probably didn’t need it at all. Thinking of moving to Chiang Mai, Thailand? Or just want to see what it might be like? Read on. We’ve pulled together lots of tips and hints that we wish we’d had when making our move. Anyone coming to Thailand will need either a visa or a visa waiver. For stays over 30 days everyone needs a visa for Thailand. The type of visa you need will change depending on which country you come from. We recommend you visit the Thai Embassy website to determine the correct type of visa for you. Duolingo – A great little app that challenges you to learn for 10 minutes a day. They use gamification techniques to keep you learning. You can choose which sections to focus on (within reason), so you can tailor your learning to things you’re interested in. We used this to help learn German. Memrise – A series of courses that use memes and other psychological tools to help you learn languages. Their Thai courses were some of the best I could find on the web. Fluentin3months – An excellent, entertaining blog by Benny Lewis. He travels all over the world and picks up languages as he goes. It was this blog that gave me the confidence to start learning Thai.